Earlier in the week, members of the Cobourg Police Service attended a business in the north end of the Town of Cobourg for a report of a man shoplifting. On arrival, Police spoke with a loss prevention officer at the business who indicated that he had apprehended a man outside of the store with a number of items that he did not pay for. As a result of the investigation, 47-year-old Robert Collette of Cobourg was arrested and charged with Theft related to the allegation. The Northumberland OPP is asking for assistance in locating a missing female from the Municipality of Trent Hills. 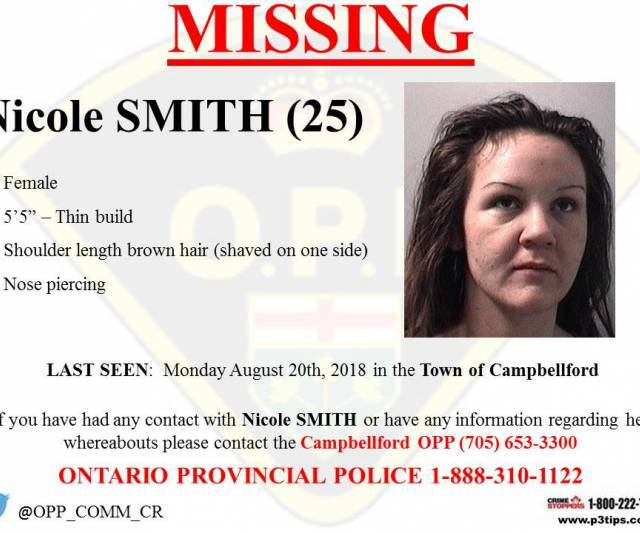 Police continue to seek assistance from the public in locating 25-year-old Nicole SMITH. Also, embers of the Peterborough County OPP are also looking for a missing female youth from last week. She was wearing black pants with a pink stripe, a grey sweater, pink footwear and carrying a light blue Adidas bag. She Is known to frequent Peterborough and Norwood areas. An accident late last night on County Road 22 east of Centreton just east of Carmel Road, has left the driver in hospital with undetermined injuries. It appears the vehicle was travelling westbound and while rounding a corner the driver apparently lost control and skidded into the ditch which propelled the car over 10 meters into nearby trees . The vehicle remained upright. First responders found the driver on the ground near the vehicle,. A search for other victims proved negative. The road was closed for several hours there is no word on the drivers condition at this hour. Thanks to our friends at Todaysnorthumberland.ca for their assistance in this story. Hundreds of citizens and vendors were present for Applefest on Main Street in Brighton last weekend when a male driving a white 4 door sedan drove through a blocked off section of the street merely missing a crowd of people. Officers located the motor vehicle and the male driver nearby. As a result of the investigation Michael James POPE (age 49) of Tweed, Ontario was arrested and charged with the following offences: Care or Control While Impaired (Alcohol), Care or Control Over 80 mgs , Dangerous Operation of a Motor Vehicle. The accused was released and is scheduled to appear at the Ontario Court of Justice in Cobourg on November 7th.